Pickling is a culinary art that has developed all over the world picking up flavours of the region. I often wonder how man started pickling so many things and so beautifully but being a fermentation enthusiast I know where it all started. Fresh produce was a luxury and whatever the people grew in one season would not be available in the next. All the surplus fresh produce was always preserved in some way or the other and we have witnessed how sun drying, smoking and pickling has solved food problem across the world. 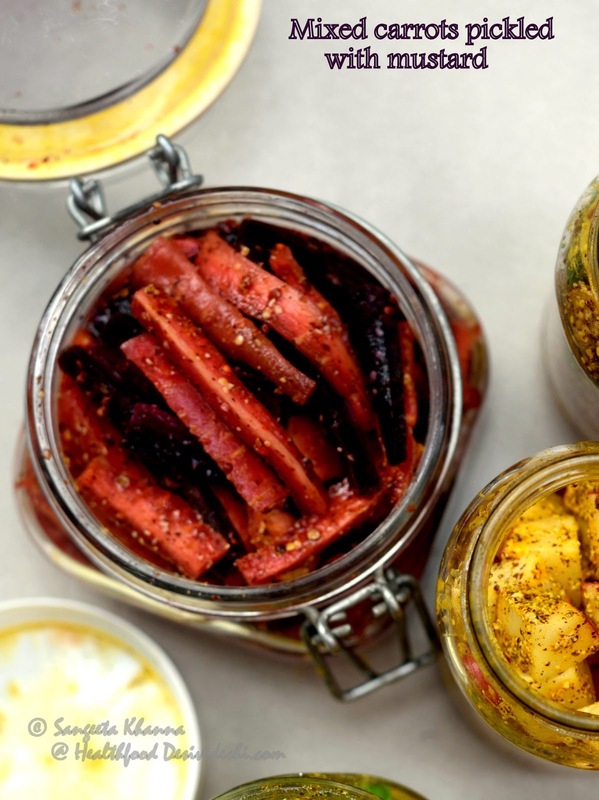 Sauerkraut, Kimchi, Umeboshi, Sakura and all sorts of brined pickles are a testimony of how pickles have been an integral part of life all over the world. 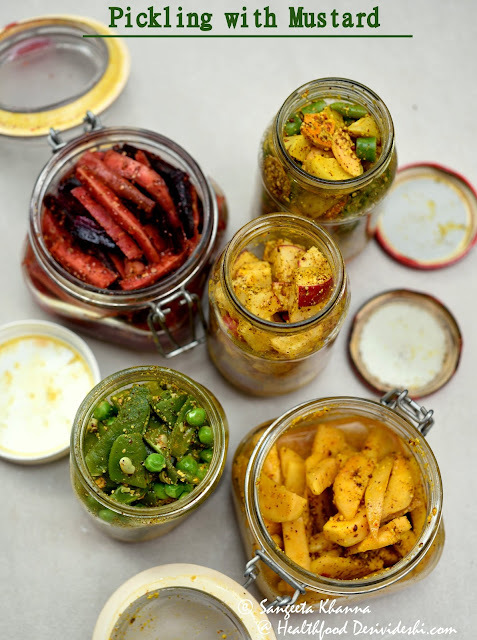 In India we have so many variants of pickles made using spices and without spices, with oil or without oil and every season has a different produce to be pickled. Some of these pickles are made in such a way that they last several years but since it is a common practice to make pickles every season they are made just enough to last one year. Unless it is a pickle that is considered medicinal in it's aged form. 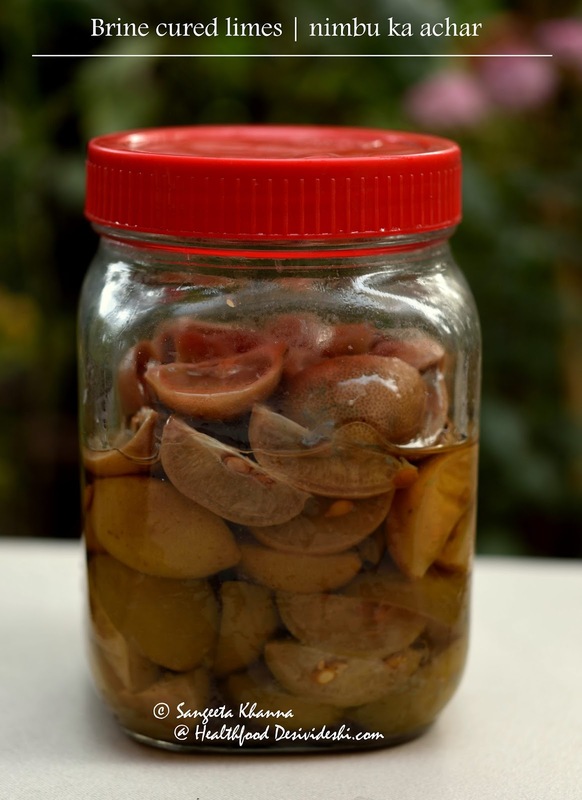 One of the aged pickles very popular in my region is the nimbu ka achar (called as nibuki in local parlance) which is basically brined limes, whole or quartered. It is given to someone with upset stomach with a thin mung ki khichdi and some fresh homemade (cultured) yogurt. I have shared some brined pickles like this amla and ginger pickled in brine. Another is this wild fig pickled in brine. One of the variety of seasonal pickles is mustard fermented pickles, very popular in winters as the seasonal produce responds well to this method of pickling and traditional winter meals also pair well with these mustard fermented pickles. These pickles are also called as pani ka achar (watery pickle) in my part of the world for obvious reasons. Yes, mustard helps fermentation along with red chilly powder (much like Korean Gochugaru) and we make kanji using the same method in a watery medium. For the seasonal vegetables to be pickled we don't add any water because the vegetables have enough water in themselves to let the flavours soak in. Beautiful play of osmotic pressure in these pickles that is utilised for culinary use since ages. The mix of mustard, red chillies, turmeric powder and salt is immensely medicinal as well. Mustard is known to improve metabolic rate and as an anti inflammatory agent, it improves blood circulation and is antiseptic too. Turmeric is another antiseptic herb that is antioxidant rich, anti inflammatory, analgesic and antiseptic. Red chillies are known as powerful analgesic and anti inflammatory because the capsaicin improves blood circulation, helping the body to heal naturally. With so much goodness these pickles are indeed quite healthy. To add to the health quotient of these pickles the fermentation process makes them probiotic too. 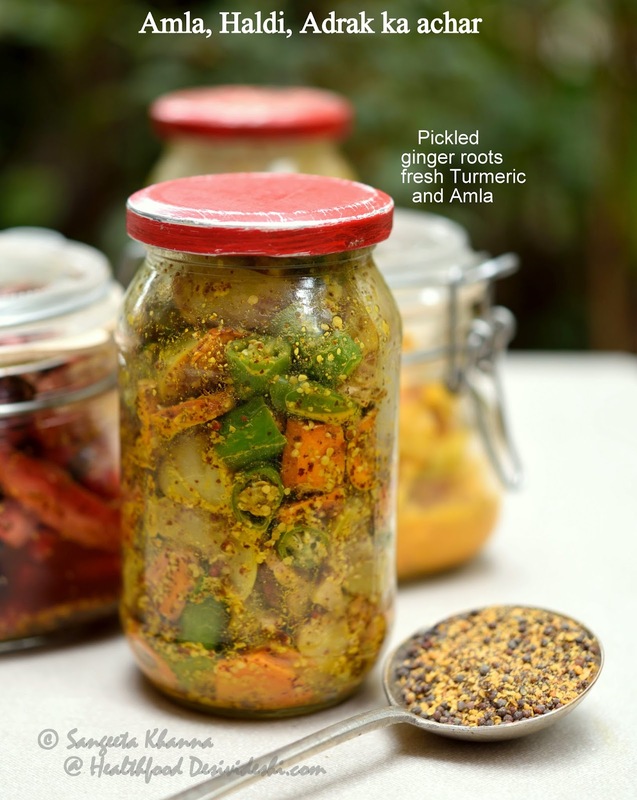 What an easy way to get wholesome nutrition and healing benefits from homely pickles. The good thing is that you can use almost every vegetable to make these pickles. Traditionally the gourd family vegetables are not pickled but once you get the hang of it you might want to try those too. These pickles are made during winters mostly, probably because they aid in digestion and help the gut health too. 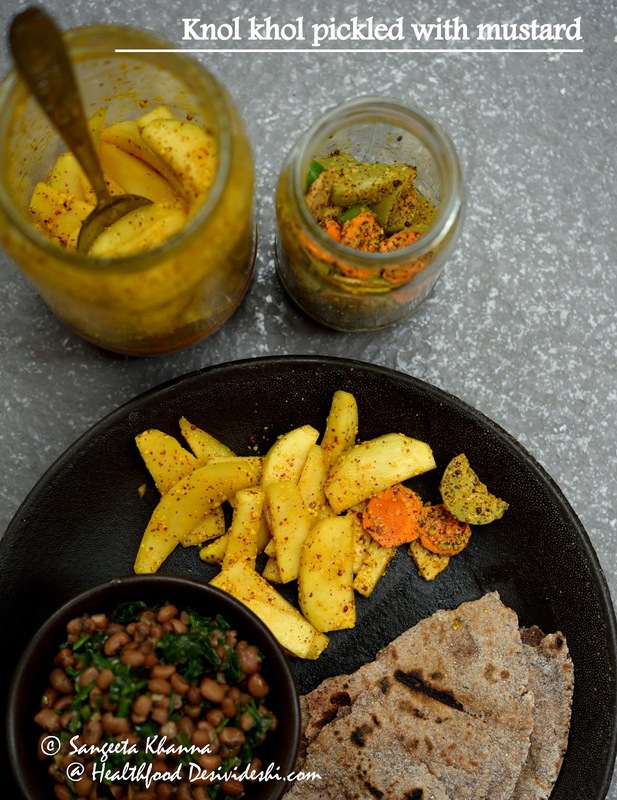 Traditionally winters means heavier foods and increased consumption of ghee and fried food that tastes really great with these pickles I must add. The traditions develop for a reason of course. 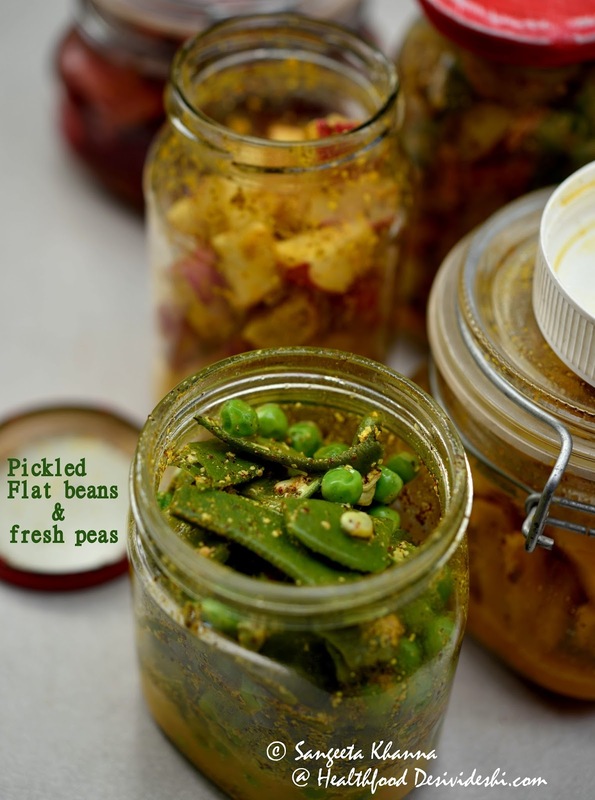 The vegetables that are used for this kind of pickling are mostly root vegetables, ginger, fresh turmeric, some beans specially the flat variety, cauliflowers, some leafy greens like chickpea shoots and even fresh green peas or soaked chickpeas. 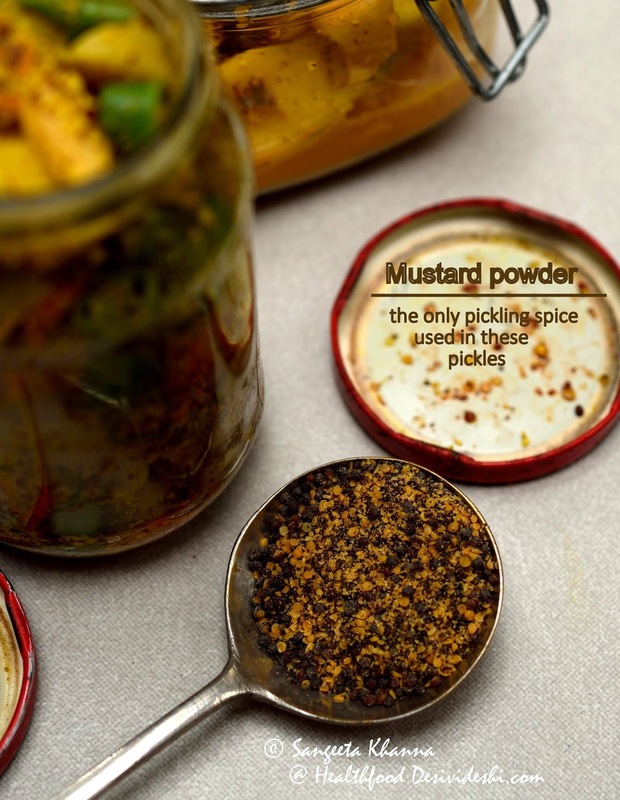 This mustard fermented pickle is made in the north India. The vegetables being pickled may differ in different regions. 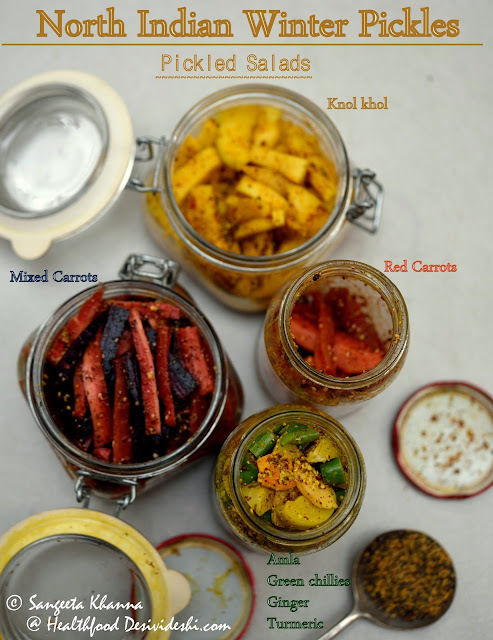 Gajar-Gobhi ka achar (pickled carrots and cauliflowers) and mooli ka achar is staple in Punjab while hari mirch ka achar (pickled green chillies) is from Rajasthan. In Uttar Pradesh we pickle a lot of vegetables this way. Many families will add some soaked chickpeas to the jar of pickles when it is just about to finish to make it last longer. I like adding some fresh peas too. While the pickling spices remain the same in these pickles that is mustard, turmeric, chilli powder and salt, the procedure differs with different vegetables as some of the vegetables have higher water content some are dry. Also because some of the vegetables we like crunchy and some others are preferred a bit softer. 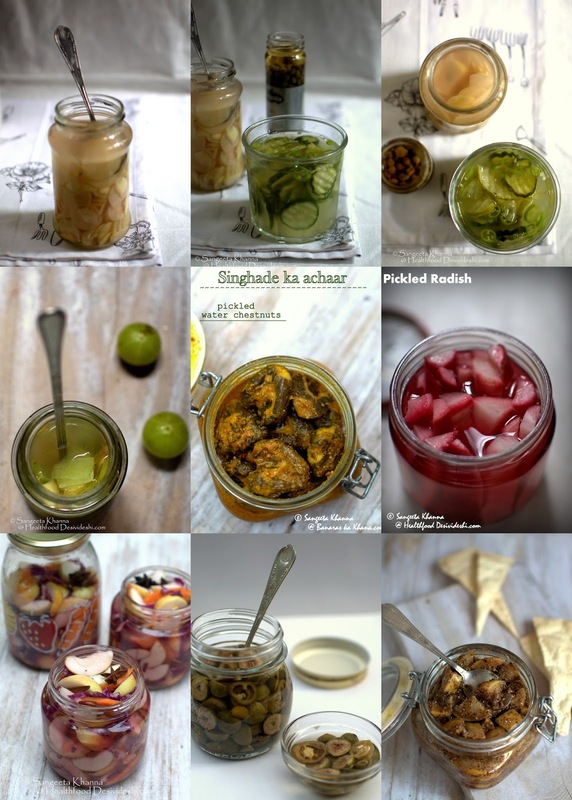 I have listed the recipes of some of the pickles I have been making. Slice and chop everything as desired and mix with all the ingredients in a glass bowl. Give a good toss and fill in clean jars. This pickle is ready to eat in about 3 hours and keeps changing in taste for 2-3 days. In Indian summers we keep it only for 2 days at room temperature and then refrigerate. The pickle keeps maturing slowly and get sharper in taste by time. If refrigerated it lasts about 4 weeks. Not many people make pickle using flat beans but it tastes really good. I like it with green peas and sometimes with added cauliflowers and broccoli etc. 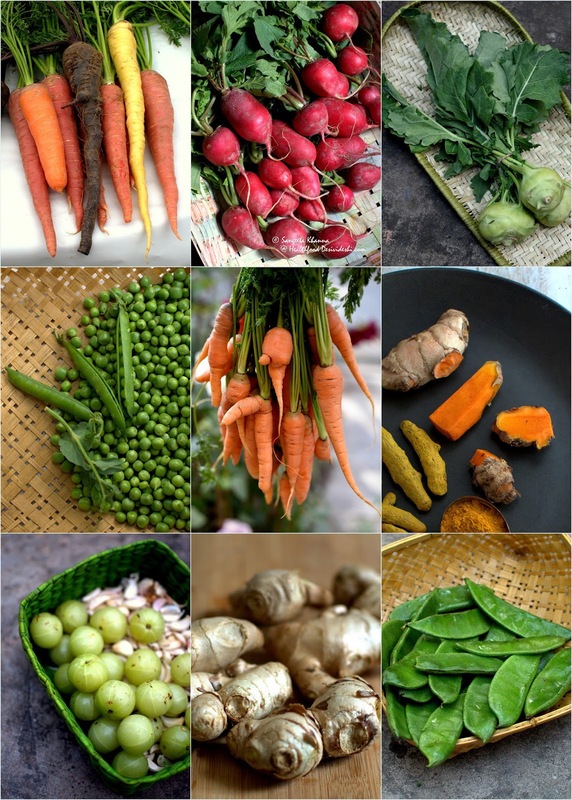 The reason for pairing these vegetables together is because these vegetables need a parboiling treatment unlike the root vegetables or amla or green chilies etc. Prepare the vegetables first. Beans, cauliflowers or broccoli need a little blanching or parboiling depending on what texture you like. String the flat beans and split them open. Cut them in pieces if you wish. Using tender beans is desirable. If using cauliflowers or broccoli, separate the florets. Boil water in a large pan and dunk everything together. Add the peas too along with everything else and wait till the water comes to a rolling boil once again. Drain the water in a colander and empty the vegetables into a mixing bowl. Add the spice mix and toss. Fill in clean jars. The pickle will be ready after 12-15 hours and will stay good for 2 days at room temperature and should be refrigerated after that. Make small quantity if you want to keep the jars on the dining table. These vegetables can be pickled together like a mixed pickle or can be pickled separately as I do. I want the vegetables to maintain their own flavours and I love them this way as a salad in generous helping. See how I eat the knol khol pickle with my meals. You can see laal chowli and rocket stew, black sorghum roti and loads of pickled salad on my plate. The radish pickle has been shared earlier. I like to toss this pickle into my sprouts or boiled chickpeas salads as shown here. This radish pickle is in fact a great way to use up any mature radishes. The mature radishes soak up the flavours faster and give a good bite to the pickle. 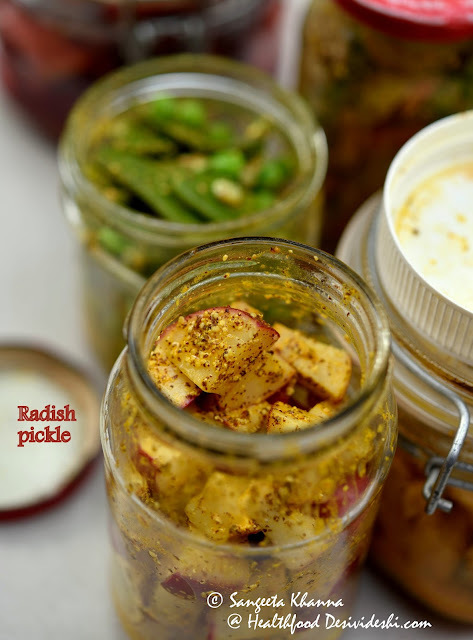 You can make the radish pickle using any kind of radish available. I often use mixed carrots to make the carrot version of this pickle and have experienced that the mature and large carrots taste better in this pickle. Here I have used black carrots that are normally used for making kanji along with the red carrots that are normally used for making gajar ka halwa. Mix everything up and fill in clean jars. These vegetables soak up the flavours faster and get ready to eat in 2-3 hours. You can wait for 2 days to get the sour flavour and then refrigerate for 3-4 weeks. We even pickle boiled potatoes this way but the pickled (boiled) potatoes do not stay for long. Once made the pickle is ready to eat instantly and can be kept on the dining table (room temperature) for 2 days in winters and for a day in summers. Luckily I found this boiled potato and chickpea shoots pickled with mustard. In my family the chickpea shoots (chane ka saag) was not pickled but once I was talking to Arvind's aunt and she told me they pickle chane ka saag this way. So next time I found some chane ka saag I wanted to try this. 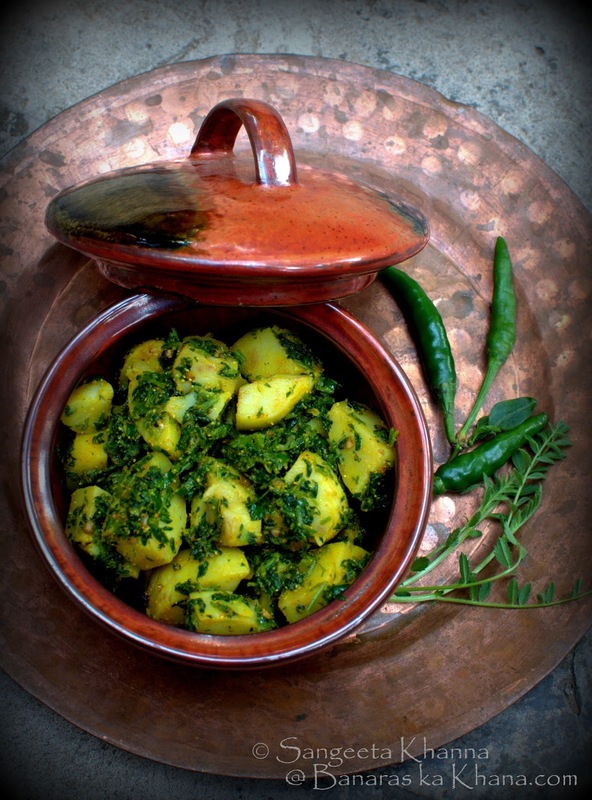 The chane ke saag ka achar was so good I started combining it with the boiled potato version. It gets over quickly whenever I make it. I would suggest to make this version just enough for a day's worth. Toss everything together and mix well. Keep covered for an hour before serving. This is actually a wonderful potato salad that I love making whenever I get hold of chane ka saag. Actually I call all these mustard based pickles as pickled salads as these can be served just like the salads or kachumbers we serve with Indian meals. I make more pickled salads if you want to check out. If mixed with some sprouts or boiled chickpeas or even some paneer, these salads can become a salad meal. See how I mix them up to make my meals here. These salads are generally called as pani ka achar in Uttar Pradesh as I mentioned. The reason being there is no oil used in this pickle while other Indian pickles use oil to preserve the pickle for long. You see you can pickle almost everything and have a great value out of your pickling efforts. These pickles are easy and cheap, provide great nourishment and also help heal the body, especially the gut. More reasons to make them as soon as possible. Do let me know whenever you make them. Nice to know of these oil free pickles...is the alu achar a bit similar to the Nepalese alu ko achar that uses sesame seed powder and timmur? Thanks Arpi. This alu ka achar is quite different from the Nepalese version. Thank you for the reply. Will be making some of the above mentioned pickles soon! Thank you Corinne. I would love to know how you liked these pickles. Try the flat beans pickle please. What an informative post, Sangeeta!! I make gajar kanji every winter. Love the chane ka saag, aloo pickle and seem pickle too. Thanks for sharing! Glad you liked these pickles Priya :-) Thank you. Yes...today I think I should use that frozen bag of amla....I love amla so much that whenever I get chance i get frozen amlas.... then I kinda struggle/forget to use it. I love fresh ones...and when we get fresh here they are soaked in salt water...last time i got i felt sorry why i got them...they were overly salted, way too much...I use frozen ones here & there in chutneys & smoothies etc. but b'coz they are so watery so steer away from making achar with those, but I miss amla achar my mom use to make....my mil did made once with frozen once when she was here....but i guess time to try myself...will let u know....btw we are under snow storm today & there is always a possibility of power outage so better I use those amlas now :) though fingers crossed for no power outage. I am eager to know whether you could make the amla achar or not :) I love amla too. Sangeeta, i made the achar......asked my mil what to do she suggested to stick with regular sarso ke tel mein saunf_kalonji+methre & awla saute for few minutes, for frozen awlas.....so used half bag for that.....& rest half I tried your rai wala version but ginger & awla only as no venturing out for fresh haldi in snow storm :) tasted a piece only after few hrs. it was very dry kind...while chopping lost lot of liquid from amlas....so may be that's why... i believe fresh amlas might be the good choice for this achar....but still gonna taste tomm. and finally decide if i'm gonna use it like that or thinking may be add a spoonful of sarson ka tel...let's c....will decide tomm. Oh nice. Yes if the amla looses it's water the pickle will be dry. You can add a little filtered water to it as it is a mustard based pickle, the watery liquid with mustard will get rightly fermented abd the pickle will be nice. No need to add oil. But you can try both in small batches to see what you like more. so, do u think if i don't add water it is still fermented or it does need some liquid to be properly fermented....b'coz my main aim behind rai version was to get naturally fermented achar. As i tasted it again i think it's not bad if eating as achar with roti etc. eating it just like that(that's the prefered way for me) doesn't taste much good bcoz of dryness. The fermentation will definitely be better if you add water. Do try and let me know. sorry for the late reply dear....but i did added few tsp. of filtered water to half of rai wala achar...def. better then dry kind...for future i'm thinking i should not defrost the amlas fully so that i don't loose all the water from it. Hey you can add as much water as you need to submerge the pickle. The salinity of the water should be the same and the pickle will be great. And yes next time just pickle the amla whole while it is still icy, the juices from the amla itself will be good enough to make it watery.